© John R. Bentley 2007. Welcome to my workshop. There are no large machines, since I make small things. The exception is my bench vise which is very substantial - however I consider a large mass a necessity for filing. 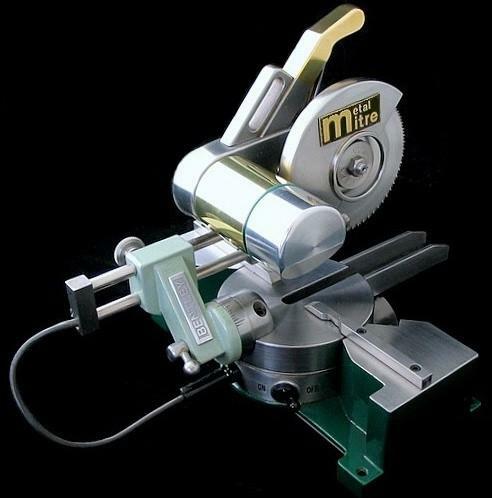 Originally the operations in my workshop centered around a single Taig lathe, a small bench drill and a 5-inch bench grinder, all purchased in the 1980's. Here is an example of a miniature tool made from scratch in this workshop. This is a 3-inch circular saw. The green steel base contains nickel cadmium cells, a charging jack and indicator to supply electricity to the motor. It is a powerful motor from a cordless grass string trimmer. It can be used to cut metal by using an abrasive blade and the performance really shines when a woodcutting blade is installed. The cuts are extremely fast and clean. 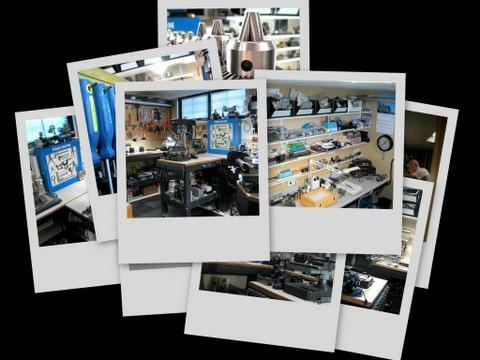 They say home machine shops are just used to make more tools for home machine shops. There is a lot of truth in that, but in my own defense I will say that I did find this machine was a most useful tool when cutting decking planks for my model tugboat. For ten years I happily constructed models, made machine tool accessories and did metal-related household repairs with the three original machines mentioned at the top of this page. All three survived the punishment, coming through that decade looking like new. I have since purchased an Asian mini lathe, a new drill press, a 6" grinder, a Taig manual mill and a new Taig lathe. I have lots of pictures I would like to share, it is only a matter of finding the time to select suitable images and make appropriate pages. Using the Lomo MBC-10 Stereo Microscope in the model workshop and attaching it to the Taig Micro Lathe.